We sat down with Lebo M. and producer Michael Cassel to get to know more about the inner-workings of their creative process. When you were working on the music for the animated feature, did you foresee that it would be the phenomenon that it would eventually become? Lebo M: I wish I had. (laughs) No. Actually I don’t think any of us had any sense of what the film was going to do or be because it was a new approach in doing animation. We worked on it in bits and bits, which I think was unique because it didn’t give me a sense of the whole thing until it was finished. But I can’t even imagine that I thought or knew that it would be this blockbuster then. Can you tell us what the process was like of moving your music from the screen to the stage? Lebo M: I was lucky because if I’m not mistaken, I may have been the first person in the music department to meet with Julie Taymor coming from the film. It was intended to be a meet and greet in New York, which is when I learned that the reason I was introduced to Julie was because she was attracted to the album Rhythm of the Pride Lands, which we did after The Lion King soundtrack. So I went to New York to meet for like half an hour, but we spent the whole day. My greatest memory of that is that we actually started working. It was a creative meeting and it never stopped from there. It was the most unique experience I’ve ever had going from one project to another, let alone a project that’s transferring from film to theater. So I never felt any need to go through the process of transformation. It just became a natural evolution. What makes this production different from other musicals? Cassel: It was a year ago when we did the auditions with the creative team in South Africa. We tried to find the very best people to be in this production. 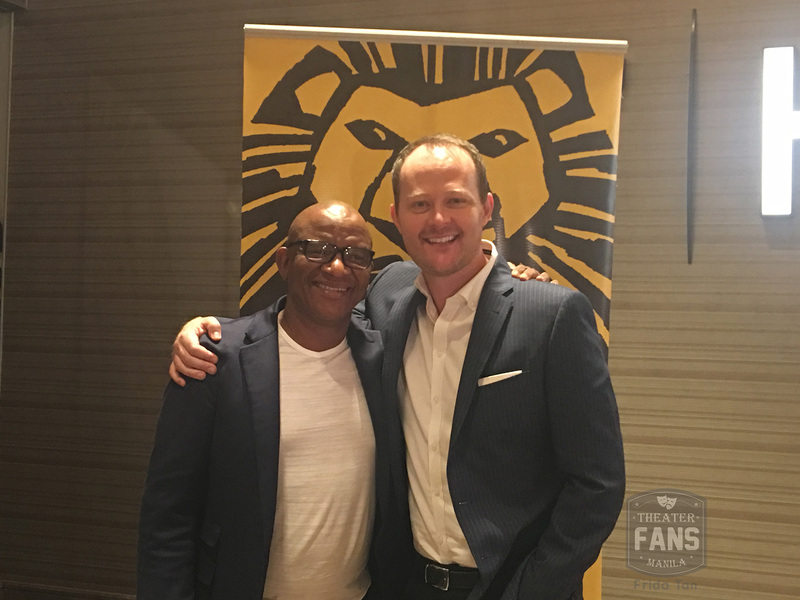 We were able to enhance it with cast members from all over the world and you don’t have the opportunity to do that when you’re creating a production, let alone The Lion King because it’s usually sitting in one place for a very long period of time. You’d want to showcase that entire community of talent. So what’s really exciting about this is there’s 19 nationalities represented on stage and behind the scenes. And so while we’re recreating The Lion King in its 21st year, what really makes this special is having all of these talents, all of these cultural experiences that everybody brings together. We saw that on the first day of rehearsals here in Manila. We brought everybody together, and it was like the meeting of the United Nations. There was such excitement in the air. It was palpable. I think that excitement and that talent give Lebo and the creative team something really wonderful to work with. And I think that’s why this cast that Manila audiences are now enjoying and hopefully we’ll be able to take to audiences around the world, are what’s so very special about this version of the show. What encourages you to keep working on the show? Lebo M: It always feels like the first time. When you’ve worked with people you’ve come to love around the world, you have a global family of professionals doing something you love. It doesn’t take an extra effort to wake up and do it. Now in a show like The Lion King, especially this kind of production that has such a diverse group of people from many different countries, you wake up looking forward to doing it. When I first entered the first rehearsal here a couple of days ago, it feels unique because I don’t feel like I’ve been doing this for 22 years. And very few jobs in the world are like that. You meet new people, new countries, adventures everywhere, but the work itself feels like the very first time you’re doing it because of the infrastructure of the people you’re working with– old friends and new people that create amazing energy. How does it feel to have created something that moves people to tears? Lebo M: I feel the same [as them]. I get moved all the time. As we were walking here, we were talking about Mufasa, I was moved to almost tears. I feel a “part of”, because I’m not crying alone and I’m not moved alone. You realize over many years that you are part of something so unique and so beautiful. It doesn’t feel like Lebo alone, or Michael Cassel alone, or Julie Taymor alone or Elton John alone. It feels a “part of”, and there’s nothing more awesome than that. I get that all the time. I’ve done a lot of other projects, I’ve done a lot of other movies that I don’t have to go back to everyday, but The Lion King is the one thing that feels new all the time. I get the same goosebumps that the audiences feel and it’s great to be a part of it. At the after-party after the show’s gala night, Lebo M. led the cast in singing The Lion King’s ‘One by One.’ Watch their beautiful impromptu performance in the video below! Previous SNEAK PEEK: The Lion King’s ‘Circle of Life’, ‘The Lioness Hunt’, and more!